In case you missed the last 2 Cubao Expo Bazaars, there's still another one scheduled for December 4! Since 2007, Cubao Expo has become the place where the unexpected pleasant find is the norm. 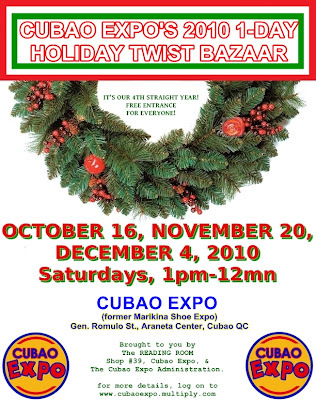 In the 2010 1-DAY HOLIDAY TWIST BAZAAR, there are 32 different sellers to satisfy your gift-giving needs. You might also want to check out the "LATAGAN SA CUBAO X!” section, where a space in Cubao Expo (the former Heritage Art & Antique Gallery) has been set aside for sellers of any goods that are vintage, handmade and art-inspired, “mat/floor-selling style”. Entrance to the bazaar is free, and there is ample parking space in the paid parking lot to right of Cubao Expo, as well as in front of the Cubao Expo compound.